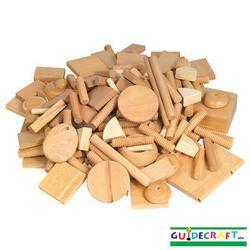 Exciting variety of wood shapes and sizes provide endless opportunities for creative expression: sort, color, build, match, glue, sand, and nail. Sandpaper included. Contents may vary. Ages 3 and up. Method of shipping is UPS Standard. Material: Mixed Hardwoods and Wood Turnings(401).